Qigong with Federico Garcia & Daniela Carraro | What is Qigong? 1) Our daily activities are usually oriented toward external objects (things, activities, perceptions) that are largely irrelevant to our life process. 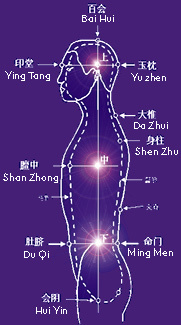 The daily activities of a qigong practitioner are interiorized in order to merge and be united with their life process. 2) Our daily activities are usually focused outward, moving from one thing to another; from the one to the many. The activities of consciousness of a qigong practitioner are centralized within a single object of focus, returning from multiplicity to unity. This point is the essence of the definition of Qigong. Through gentle movement, visualization, sound, breathing and conscious intention, the ancient yet cutting-edge practice of Qigong dynamically restores the life energy and creative power within oneself. As the underlying causes of life's challenges are released, one is harmonized with the universal source -Nature- reconnecting to the vital energy streams of life. With this practice, one can amplify the web of positive changes for oneself, our loved ones and planet Earth.